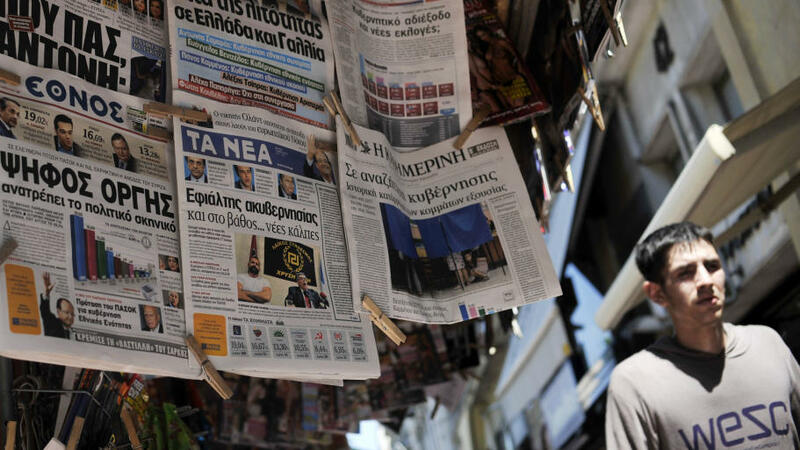 Greek newspapers on display at a newsstand in Athens on Monday after a stunning weekend election shake-up by parties opposed to further vital austerity cuts. Once the buzz of the victory wears off, Hollande is going to find that his campaign vision of rolling back austerity measures will be difficult to square with the economic realities, experts say. The bond markets and EU powerhouse Germany already have their eyes on the new socialist president, and if they sense that he's going to back away from the belt-tightening, they could sell off French bonds and drive up the price of borrowing. "It's one thing to make campaign promises. It's another thing entirely to deal with the German leadership as well as the bond market," says Alberta Sbragia, the director of the European Union Center of Excellence/European Studies Center at the University of Pittsburgh. However, doing nothing would be a very difficult move for Hollande, who would be seen as going back on his campaign promises, says Eswar Prasad, a senior fellow at the Brookings Institution. "The election results in both France and Greece cannot be ignored," he says. "I think there will have to be some easing off of the austerity." It would be difficult, for sure, to do nothing, agrees Scheherazade Rehman, director of the European Union Research Center at George Washington University. "The markets are not going to attack France right away," Rehman says. "But there is a huge risk that if Hollande take some positive steps early on that the markets could start to view France as another sick man in Europe." For Greece, the question of what to do may be nothing more than academic. The political instability caused by a wrangling for power among the various parties trying to form a government will, for the time being, virtually ensure that no big changes are made, Rehman says. It's the most likely as well as possibly the best-case scenario, experts agree. The problem is that in France and Greece, the governments there were trying to do too much at once, says Prasad. "They were trying to balance the budget at the same time as they enacted structural reform measures to increase competitiveness," he says. But starting from scratch is probably not in the cards, says Dan Kelemen, director of the Center for European Studies. "In the case of France, they are not going to renegotiate the fiscal compact treaty," he says. "What they will do and what there seems to be support for ... is to negotiate some other additional agreement that they are going to call a 'growth compact.' "
Sbragia agrees. "The best case is that there would be a way to modify the austerity in some fashion that was acceptable to the electorates," she says. The question may be one of definition. "When Hollande talks about growth, maybe he has in mind more spending on infrastructure or research, but when [German Chancellor] Angela Merkel talks about it, she might mean more structural, labor market reforms that would facilitate growth in the long run," Kelemen said. One possible scenario would see Greece and/or France pull out of the eurozone altogether. It's not very likely — at least in the short run. For Hollande, the political costs would be too high, says Kelemen. "France would be attacked by the financial markets and subjected to a sell-off of its bonds. Its cost of borrowing would soar," he says. For Greece, he says, it would be even worse — including bank runs and riots on the streets of Athens. Greece would have to unmoor itself from the very lifeline that has kept it afloat — the strength of the other EU economies. The first order of business would be to revive the drachma or some entirely new currency. "Whatever currency they created would lose 50 percent of its value from Day 1," says Sbragia. "So, they are going to print a lot of money to pay back that debt." Even if Greece tried to pay the debt back, "they will have no access to capital markets and the country will be shoved into the Middle Ages for the next 20 years," she says. But Sbragia thinks it's more likely that Greece might withdraw from the eurozone some years down the road. "That would cause disruption for sure, but [in the long run] it is something that I think could be handled," she says. One of the most extreme — and unlikely — scenarios is a complete dissolution of the eurozone and the collapse of a common currency. "If the eurozone were to somehow break apart, which I do not think will happen, that would be a worst-case scenario," says Rehman. "As we saw in the financial crisis of 2007-2008, once a global financial crisis gets started, it's very difficult to control." But the danger, while small in the short term, still exists. And it's the reason that the rest of the European Union has such an interest in making sure that Greece, for example, doesn't succumb to the urge to walk out, Kelemen says. "If Greece left, then the markets would starting asking if Portugal is going to leave, spiking up their borrowing costs," he says. "So, everyone in the EU has an enormous interest in not letting the first domino fall."